January is the month when we meet for our annual play reading but, as we gathered, uppermost in our thoughts was the sad news of the death of one of our former members, Reverend Faith Surridge, whose wise and forthright contributions enlivened so many of our meetings in the past. This year we had elected to read Henrik Ibsen’s ground-breaking study of a dysfunctional marriage, A Doll’s House. The scene is set in the Helmer’s flat, just before Christmas. From the start we are made aware of the strains in Nora and Torvald Helmer’s relationship: she eats macaroons and denies having done so when he challenges her, she submits to being referred to as his songbird, his squirrel, and generally allows herself to be treated as a naughty, spendthrift child by her overbearing, father-figure husband; she is clearly the inhabitant of the titular doll’s house. Cue the unexpected appearance of an old friend, Christina Linde, newly arrived in town in search of work, whose gentle chiding of Nora propels our heroine into revealing a secret: far from being a burdensome wastrel, early in their marriage she had saved Torvald’s life by providing the means for them to spend a year in Italy, money he thought had come from her dying father, and she has scrimped, saved and secretly worked to pay the loan back. Torvald is about to become the manager of a local bank and their fortunes will be turned around in a few days. Christina wastes no time in asking Nora to request her husband to find some employment for her. Cue the entrance of Nils Krogstad, a man with an unsavoury past who is gradually revealed to be Christina’s erstwhile lover, the moneylender who holds Nora in the palm of his hand, a former fellow student of Torvald’s and a clerk in his bank, whose refusal to call the new manager other than by his Christian name has incensed the pompous Mr. Helmer. When Torvald decides to sack Krogstad and give Christina his job, the desperate man threatens to expose Nora for the forgery of her father’s signature on the loan document. The other characters are Nora’s old nanny who now looks after the Helmer’s three children (who make a brief appearance), and Dr. Rank, a family friend who has always been in love with Nora and is now facing imminent death from syphilis, inherited from his father. And that is just the first Act. The play was considered so shocking by its first mid-nineteenth century audiences that it was refused a production in Germany unless the ending was changed. The idea that a woman should consider her first duty as being to herself and her human rights rather than to her husband and children provoked hysterical reviews, referring to the final door slam as ‘reverberating across the roof of the world’. 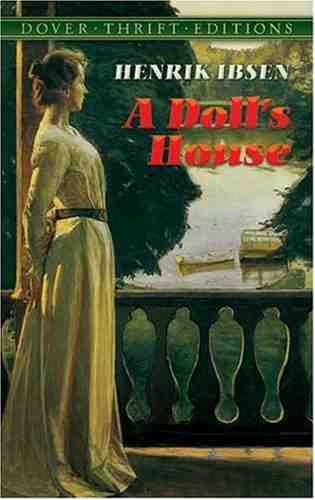 We greatly enjoyed reading A Doll’s House and sympathized with Ibsen’s reaction to its hostile reception. Thanks to Gill Brockis for hosting this particular occasion as Anne Cardew was away, and to Anne for all the other months of hospitality in 2011. Next month we meet on 9th February to discuss The Eyre Affair by Jasper Horde.